Hulhumalé is a reclaimed island located in Kaafu Atoll, the Maldives. housing, industrial and commercial development demands of the Malé region. 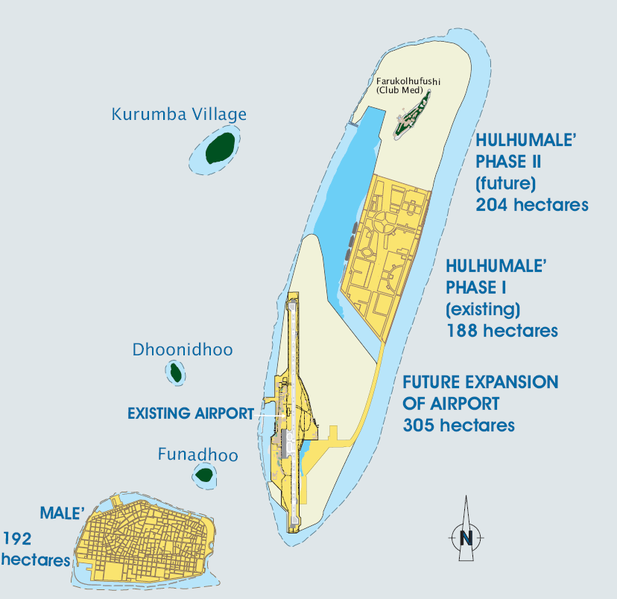 Reclamation of Hulhumalé began on October 16, 1997 on the Hulhulé-Farukolhufushi lagoon 1.3 km off the north west coast of Malé. Initial reclamation (or Phase I) consisting of 45% of land mass was carried out by the Ministry of Construction and Public Works (MCPW) costing $11 million The project was then continued by a Belgian Joint Venture Company, International Port Engineering and Management (IPEM) and Dredging International (DI) costing an estimated $ 21 million.